Affirmative action, also know as equal opportunity, is a federal agenda designed to counteract historic discrimination faced by ethnic minorities, women and other underrepresented groups. To foster diversity and compensate for the ways such groups have historically been excluded, institutions with affirmative action programs prioritize the inclusion of minority groups in the employment, education and government sectors, among others. Although the policy aims to right wrongs, it is among the most controversial issues of our time. But affirmative action is not new. Its origins date back to the 1860s, when initiatives to make workplaces, educational institutions and other arenas more inclusive to women, people of color and individuals with disabilities were set into motion. More so than any other amendment of its time, the 14th Amendment paved the way for affirmative action. Approved by Congress in 1866, the amendment forbade states from creating laws that infringed upon the rights of U.S. citizens or denied citizens equal protection under the law. Following in the steps of the 13th Amendment, which outlawed slavery, the 14th Amendment’s equal protection clause would prove key in shaping affirmative action policy. Sixty-five years before the term “affirmative action” would come into popular use, the Supreme Court made a ruling that could’ve prevented the practice from ever launching. In 1896, the high court decided in landmark case Plessy v. Ferguson that the 14th Amendment did not prohibit a separate but equal society. In other words, blacks could be segregated from whites as long as the services they received were equal to those of whites. The Plessy v. Ferguson case stemmed from an incident in 1892 when Louisiana authorities arrested Homer Plessy, who was one-eighth black, for refusing to leave a whites-only railcar. When the Supreme Court ruled that separate but equal accommodations didn’t violate the constitution, it paved the way for states to establish a series of segregationist policies. Decades later, affirmative action would seek to readdress these policies, also known as Jim Crow. For years, state-sanctioned discrimination would thrive in the United States. But two world wars marked the beginning of the end of such discrimination. In 1941—the year the Japanese attacked Pearl Harbor— President Franklin Roosevelt signed Executive Order 8802. The order prohibited defense companies with federal contracts from using discriminatory practices in hiring and training. It marked the first time federal law promoted equal opportunity, thus paving the way for affirmative action. Two black leaders—A. Philip Randolph, a union activist, and Bayard Rustin, a civil rights activist, played critical roles in influencing Roosevelt to sign the groundbreaking order. President Harry Truman would play a crucial role in strengthening the legislation Roosevelt enacted. In 1948, Truman signed Executive Order 9981. It prohibited the Armed Forces from using segregationist policies and mandated that the military provide equal opportunities and treatment to all without regard to race or similar factors. Five years later, Truman further strengthened Roosevelt’s efforts when his Committee on Government Contract Compliance directed the Bureau of Employment Security to act affirmatively to end discrimination. When the Supreme Court ruled in 1896 case Plessy v. Ferguson that a separate but equal America was constitutional, it dealt a major blow to civil rights advocates. In 1954, such advocates had an entirely different experience when the high court overturned Plessy via Brown v. Board of Education. In that decision, which involved a Kansas schoolgirl who sought entry into a white public school, the court ruled that discrimination is a key aspect of racial segregation, and it therefore violates the 14th Amendment. The decision marked the end of Jim Crow and the beginning of the country’s initiatives to promote diversity in schools, the workplace and other sectors. President John Kennedy issued Executive Order 10925 in 1961. The order made the first reference to “affirmative action” and strove to end discrimination with the practice. Three years later the Civil Rights Act of 1964 came about. It functions to eliminate employment discrimination as well as discrimination in public accommodations. The following year, President Lyndon Johnson issued Executive Order 11246, which mandated that federal contractors practice affirmative action to develop diversity in the workplace and end race-based discrimination, among other sorts. Today, affirmative action is widely practiced. But as tremendous strides are made in civil rights, the need for affirmative action is constantly called into question. Some states have even banned the practice. What’s to come of the practice? 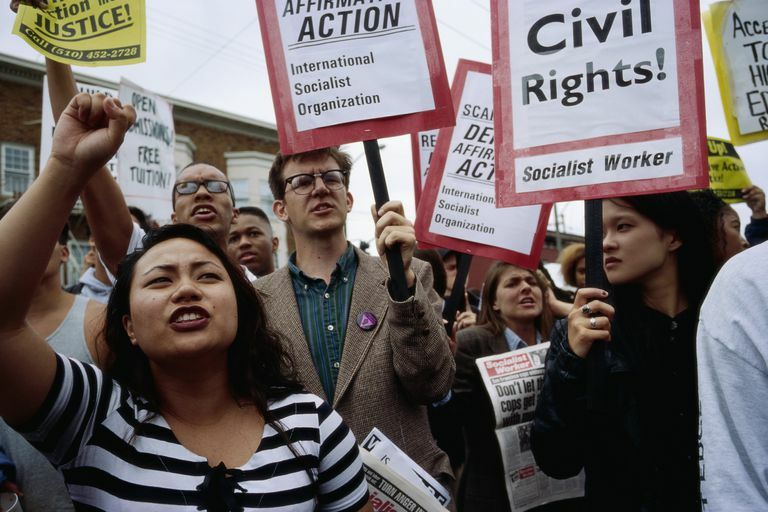 Will affirmative action exist 25 years from now? Members of the Supreme Court have said they hope the need for affirmative action is unnecessary by then. The nation remains highly racially stratified, making it doubtful that the practice will no longer be relevant.